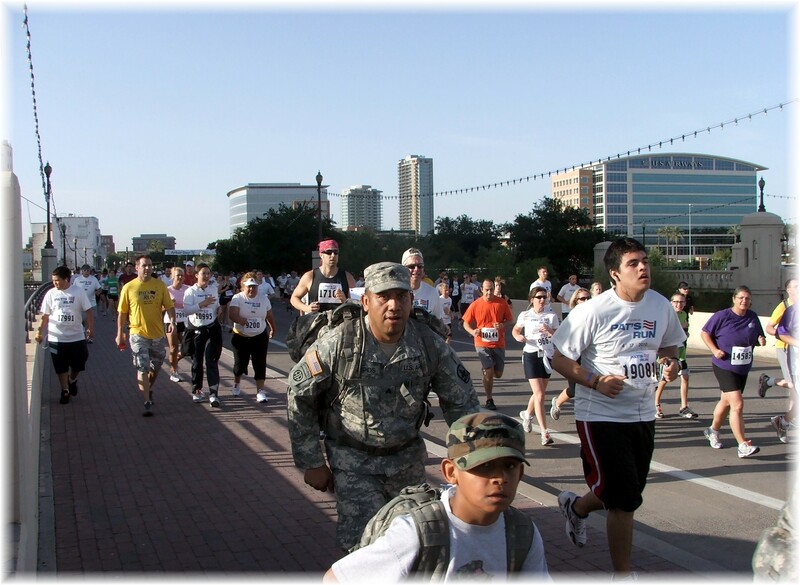 Last Saturday, over 28,000 participants were at the stating line at 7 a.m. to participate in the sixth annual Pat’s Run to raise money for educational scholarships. Pat Tillman, was a former ASU and Arizona Cardinal football player and Army Ranger. After Sept. 11, 2001, Pat and his younger brother joined the military. In so doing, Pat turned down a $3.6 million contract with the Arizona Cardinals to serve his country. On April 22, 2004, Pat was killed by friendly fire while serving in eastern Afghanistan. 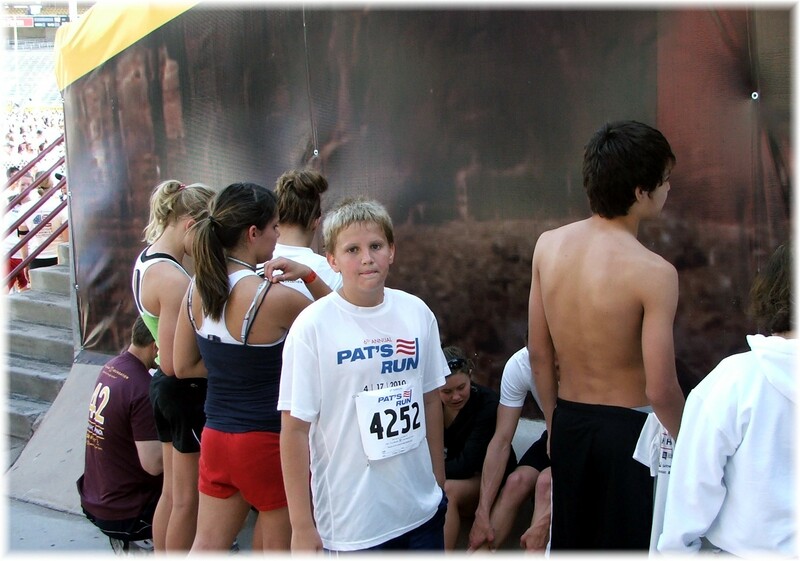 My motivation for attending was to watch my son, Austin, run in the event. Unfortunately, with over 28,000 participants it was impossible to find him in the crowd. But while attempting to photograph my son and other friends that were in the race, I stood on the Tempe Town Lake bridge next to a banner with a quote from Steve White, a friend of Pat and Navy SEAL. In referring to the years in between his friend’s birth and death, 1976 – 2004, ” ……. that one little dash represents a lifetime. How do we spend our dash?” It’s not the start or end of life that matters but what we do in between. People participate for different reasons. Some do it to support a good cause and enjoy the comraderie of fellow runners. For others it represents a milestone in their quest to shed a few pounds or become more fit. Other use it as a training exercise and run in army fatigues and a backpack! Races like this with runners of different abilities are interesting because the leaders are sprinting along and make it look so easy. Then towards the end the participants have a much slower pace and you wonder how they’ll ever complete the 4.2 mile course. Training can make all the difference in the world. 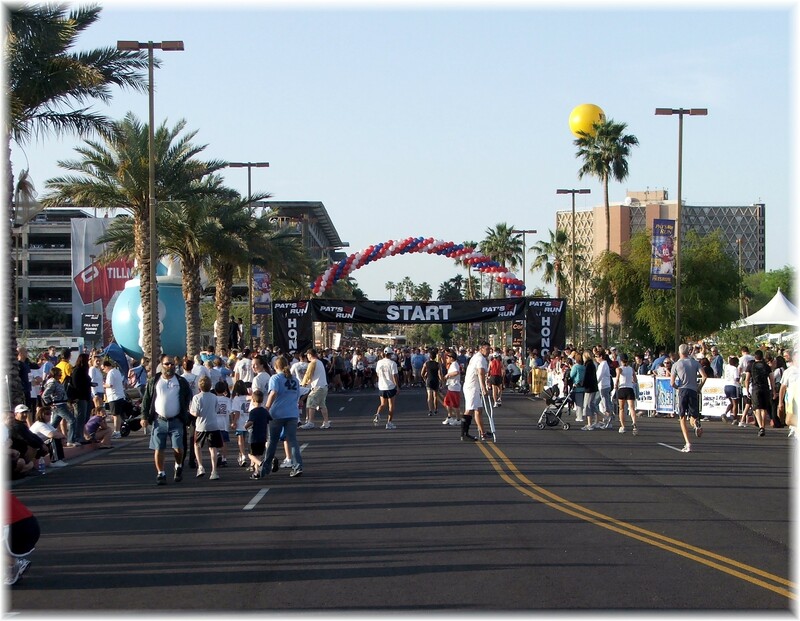 The race ended in the ASU Sundevil football stadium. That was one of the few places in the Phoenix valley that could accomodate a crowd that size. We finally caught up with Austin to take the picture we missed along the way. 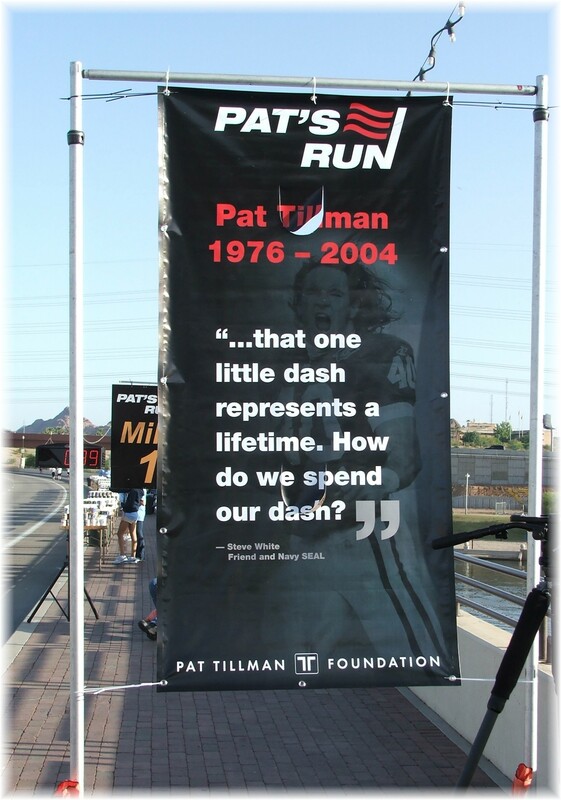 If you’re ever in town in late April looking for an enjoyable way to get in better shape, check out Pat’s Run. For real estate information about the Phoenix area, visit my Buyer and Phoenix Relocation website.